(Newser) – With just four days to go until the presidential election, Mitt Romney and Barack Obama are squaring off one last time—in dueling op-eds on CNN's website. Of course, at this late stage, neither candidate is revolutionizing their campaigns, but it is one of their last chances to lay it all on the line. For Romney, that means adding 12 million jobs, "fiscal sanity," restoring slashed defense spending, and plenty of freedom. "We're all in this together. 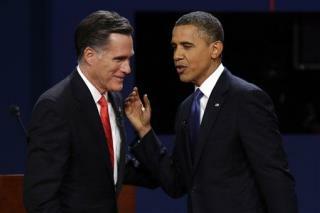 And together we can emerge from these troubles," Romney writes. Cannot wait for republicans across the country start to choke on their on vomit when Obama wins.